Nothing conveys complex ideas in a simple format more clearly than a doodle. While the humble pen and paper will never go out of fashion (you heard it here first), I’d recommend Paper by FiftyThree for the more digitally inclined. Paper is a drawing and painting app for the iPad, available for all three generations of the device. The app was developed by the same team which came up with Microsoft’s Courier tablet, and they’ve taken their experiences from that failed but praiseworthy project and applied it to this amazing program. Paper is simple, almost to the point of being bare bones. You have five tools, nine colours, and as many journals as your imagination can fill. That’s it. There’s no zoom, no brush sizes, no layers. This app is designed for users of all levels of artistry to pick-up-and go, and get their thoughts and ideas and turn them into illustration quickly. What it lacks in number of features, the app more than makes up for in usability and intuitiveness. The ink, pencil, marker, pen, and brush tools all convey a sense of realism. While you can’t change their sizes, you can work your brush strokes faster or slower to change widths and opacity. There are only eight colours to choose from, but you can quickly blend yourself new shades by combining two or more colours like you would in real life. Instead of a back button, Paper employs a two finger counter clock-wise gesture which lets you ‘go back in time’ on your drawing. After using Paper for a few hours I found myself enamoured with it. I’ve done sketches, landscapes, watercolours, technical diagrams, and non-sensical charts and have even set up a blog to show people my work. Using a VGA output I was able to show my drawings using a projector or on a connected TV. Where this app falls short is in sharing and exporting the content you’ve worked so hard in creating. There are options to share your drawing to Tumblr, Facebook, Twitter or via email - but there needs to be further integration with services like Flickr, Dropbox, and Evernote. I was also disappointed there is no Android version of this app, especially considering the digitiser technology used in a lot of new Android tablets would make for much more accurate drawings than what can be made on an iPad. 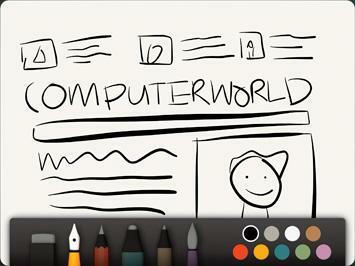 The FiftyThree team have said they are adding new tools, features, and colours.